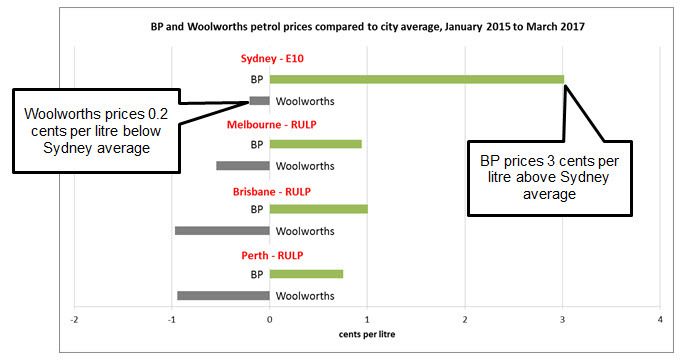 “BP prices are significantly higher on average than Woolworths prices in the major capital cities (see charts below). BP generally increases prices faster than Woolworths during price increase phases, and is slower to discount during the price discounting phase of cycles,” Mr Sims said. “Fuel is a major expense for many households, and even a small increase in prices due to reduced competition will have a major impact on drivers,” Mr Sims said. “This acquisition will likely affect metropolitan price cycles by making the price jumps quicker, larger and more coordinated. Reduced competition will also mean that prices will not fall as far, or as quickly, in the discounting phase of the cycle,” Mr Sims said. In forming its view, the ACCC conducted extensive data analysis of all major retailers’ fuel prices to determine the effect that BP and Woolworths have in both local and metropolitan-wide areas. The ACCC considered whether the competition concerns in metropolitan and local areas could be addressed by divesting sites. “This has been the most significant merger investigation and decision the ACCC has considered in 2017. The ACCC has determined that the underlying concerns arising from the proposed acquisition would not be addressed by the divestments proposed by BP,” Mr Sims said. The ACCC took into account a large number of submissions from a broad range of market participants including motoring groups, competitors, and both corporate and individual consumers. The chart below, which was published in October when the ACCC released its study into the Brisbane petrol market, highlights the difference between each major retailer’s average regular unleaded petrol (RULP) price and the market average RULP price in Brisbane in the period 1 January to 30 April 2017. The chart below shows the average price at BP company controlled sites and Woolworths sites, compared to the city-wide average, in each of Sydney, Melbourne, Brisbane and Perth, for the period of 1 January 2015 to 28 March 2017. The results for Brisbane are different to the above chart due to the different data-sets analysed. In a separate decision, and applying a different legal test, the ACCC was also required to consider authorisation applications from Woolworths and BP relating to aspects of their proposed commercial alliance. The ACCC has decided to grant those applications for authorisation subject to conditions. These conditions specify that BP and Woolworths must limit shopper docket and loyalty scheme discounts to no more than 4 cents per litre (in total per fuel purchase). Woolworths would not be permitted to fund more than 2 cents of the 4 cent discount. While discounts to consumers are generally beneficial, the ACCC has long-standing concerns that fuel discounts offered through shopper docket or similar schemes can have anti-competitive effects if they are at a level that efficient fuel retailers are unable to match. The ACCC has also expressed its concern about the potential for supermarket funding of fuel discounts to distort competition in fuel retailing. The conditions have been imposed to address these concerns. However, the authorised conduct would only occur in the event BP acquires Woolworths’ network of service stations. As noted above, the ACCC today announced that it intends to oppose that proposed acquisition. Further information, including a copy of the decision, is available from the ACCC’s public register: BP & Ors – Authorisations – A91580, A91581 & A91582. The ACCC commenced a public review of the proposed acquisition on 15 March 2017 under the informal merger review process. On 28 April 2017, the ACCC commenced the related, but separate, Authorisation process for the loyalty program and shopper docket discount scheme. The ACCC’s assessment of the proposed rollout of Woolworths’ Shopper Docket Discount Scheme and Loyalty Program was conducted separately to the assessment of the proposed acquisition. These two assessments have been undertaken separately because Woolworths and BP applied for authorisation of some aspects of the proposed transaction under a specific authorisation process set out in the Competition and Consumer Act 2010, and also sought clearance for BP to acquire Woolworths’ petrol stations under the ACCC’s informal merger clearance process, which is a separate process. As required by the Competition and Consumer Act 2010, the ACCC did not take into account any detriments or any benefits resulting from the proposed acquisition (if it were to proceed) as part of its assessment of the authorisation applications. On 10 August 2017, the ACCC released a Statement of Issues in relation to the proposed acquisition outlining preliminary competition concerns. On 29 August 2017, the ACCC released a Draft Determination in relation to the Authorisation process (BP & Ors – Authorisations – A91580, A91581 & A91582). BP supplies fuel to approximately 1,400 BP-branded service stations throughout Australia. Of these sites, BP controls approximately 350 sites, via ownership or commission agency arrangements. Additionally, BP sets the price of diesel only at approximately a further 30 ‘diesel commission agency’ sites. At the remaining BP-branded sites prices are set independently by third-party site operators.